Tampa blends the vibrant atmosphere of a big metropolis with ample recreational opportunities that include laid-back canoe rides, wildlife watching and wilderness hikes. Picture-postcard Gulf beaches unfurl for 20 miles to the west, including lively Clearwater Beach and the more secluded bays of Caladesi Island State Park. For child-friendly attractions, it doesn’t get much better than the rides and animals at Busch Gardens. Over recent years, Tampa has experienced a major style injection. Many visitors head straight to historic Ybor City, a Cuban neighborhood known for its vibrant dining scene, lively bars, clubs and music venues. Located halfway down Florida’s west coast, 25 miles east of the Gulf of Mexico, the town sits on Tampa Bay and is bisected by the Hillsborough River. Some 60 miles north of Sarasota and 85 miles southwest of Orlando, Tampa basks in a moderate semitropical climate. Beyond Tampa’s suited-up downtown, with its glass and steel behemoths, Tampa offers visitors of all ages top-notch museums, attractions and innovative restaurants scattered through revitalized neighborhoods. Running through town, the Hillsborough River is flanked by the new Riverwalk, with flashy architecture, artfully designed gardens and myriad food vendors serving everything from fresh seafood to Southern barbecue. For families, the city’s main draw is undoubtedly the Busch Gardens theme park, with its thrilling rides, themed attractions and a zoo that’s home to more than 2,000 exotic animals. Across the street, Adventure Island’s lush, exotic setting forms the backdrop for every conceivable water-themed pursuit. The revamped seaport area east of downtown, known as Channelside, forms the city’s retail and culinary hub and is home to the world-class Florida Aquarium, with over 20,000 aquatic animals and plants, including sharks, stingrays and moray eels. With scenic rivers and some of the nation’s most photographed white sand beaches within a 30-minute drive, Tampa Bay draws nature lovers and adrenaline-seekers in equal measure. Clearwater Beach is a snowbird’s (and spring breaker’s) perennial favorite and host to a popular daily sunset festival at Pier 60. For more solitude and wild scenery, the protected sands and turquoise waters of Caladesi Island State Park can only be accessed by boat. Some 30 miles southeast of Tampa, Alafia River State Park is home to a network of 40 miles of hiking, horseback and bike trails. On-the-water enthusiasts flock to Hillsborough River State Park, an access point for the 34.5-mile Hillsborough River Canoe Trail and favored among locals for its calm swimming, fine fishing and family-friendly hiking trails. At Little Manatee River State Park, wildlife enthusiasts can hike one of the state’s premier hiking trails, a 6.5-mile loop that traverses a wilderness area comprised of rare ecosystems including sand pine and oak scrub. Tampa boasts a robust lineup of festivals and events that celebrate the region’s history, cuisine and landscape. In February, the Florida State Fair delivers the customary agricultural and artistic themed exhibits and competitions as well as carnival rides. 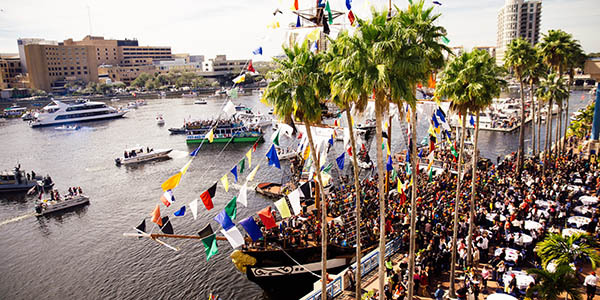 Held during January, the Gasparilla Pirate Festival celebrates the town’s buccaneer legacy with a street parade along with a virtual fleet of pirate-themed boats invading the bay. Ybor City is known for its vibrant strip of bars, live music venues and nightclubs. As one of just a handful of National Historic Landmark Districts in the state, Ybor City’s evocative architecture features a handsome ensemble of brick buildings wrapped in arabesques of wrought iron. Many of the original cigar factories have been transformed into eclectic boutiques, hip restaurants, coffee shops and contemporary galleries.